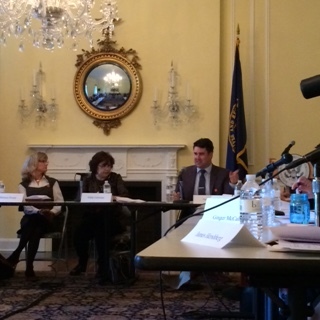 Nate Jones (R) speaking at the most recent FOIA Advisory Committee meeting. OGIS’s Nikki Gramian is center, and OIP’s Melanie Pustay is on the left. This week an expert panel comprised of representatives from the Access Board and the General Services Administration addressed the FOIA Advisory Committee’s October 25 meeting and answered questions on 508 compliance. 508 compliance refers to a section of the Rehabilitation Act that has required agencies to ensure that persons with disabilities have comparable access to government information as persons without disabilities and that federal employees with disabilities can access records with the same ease as their counterparts since 1998. It is also often cited by agencies as a reason they cannot post FOIA releases online, because either making documents 508 compliant is too difficult or agencies fear being sued for posting “non-compliant” documents – even though all documents created after 1998 are required to be accessible so that agency employees with disabilities can still access them. The National Security Archive’s FOIA Project Director Nate Jones, after pointing out the problem of contractors monetizing the technological burdens of making documents 508 compliant, asked the panel for the citations used to make claims that agencies are allowed to use disclaimers to post documents online that are not 508 compliant and what constitutes an undue burden. The FOIA and 508 statutes should not be at loggerheads, and the Sunlight Foundation’s Alex Howard emphasized during the public comment period that, under no circumstances, should a statute mandating greater access be distorted by agencies to undermine the FOIA’s intent to disseminate the most information to the most people the most quickly. The meeting was recorded, but the video will not be made available until it is made 508 compliant. Rumsfeld’s short memos were called “snowflakes” for their abundance and being on white paper. Donald Rumsfeld was famous for sending out short memos, often referred to as “snowflakes,” during his tenure as Defense Secretary – regularly producing between 20 and 60 a day. The National Security Archive filed a FOIA request for these “snowflakes” in 2007 – that has not yet been fulfilled. Some of Rumsfeld’s snowflakes have, however, been released under different FOIA requests. 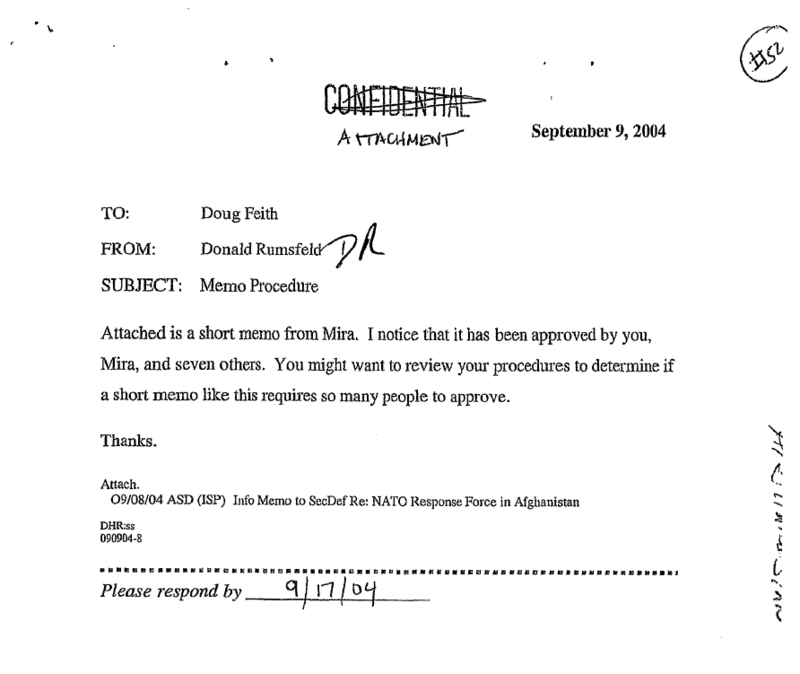 A 2012 FOIA request to the DOD for 2004 Afghanistan records produced an ironic September 9, 2004, snowflake from Rumsfeld on “Memo Procedure.” The note reads: “Attached is a short memo from Mira. I noticed that it has been approved by you [Doug Feith], Mira, and seven others. You might want to review your procedures to determine if a short memo like this requires so many people to approve.” The memo referenced is entirely redacted. A FOIA lawsuit filed by VICE News’s Jason Leopold has won the release of several reports that reveal the high rates of post-traumatic stress among Guantanamo prison guards. One of the released reports, a 2011 Army Institute of Public Health study, notes that “Between 2008 and 2011, the joint task force that operates the detention facility secretly evacuated at least 19 troops who had worked in detainee operations due to severe ‘behavioral health reasons.’” The study also found that 1 in 5 troops were considered to be a high behavioral health risk – for having suicidal thoughts or exhibiting behavioral conditions like depression that required “intensive medication management and/or therapy.” The study recommended, among other things, that the “military pre-screen all troops prior to their deployment to Guantanamo to identify pre-existing behavioral health conditions,” although a Guantanamo spokesperson would not confirm if any of the recommendations were implemented. This week’s Cyber Vault update includes a heavily-redacted April 1999 FBI memo that summarizes recent developments in a series of computer infiltrations that began in 1998 and lasted almost two years. Codename MOONLIGHT MAZE, the investigation traced the attacks to Russia – although Russia denied any involvement – and revealed serious gaps in the U.S.’s cyber defense. 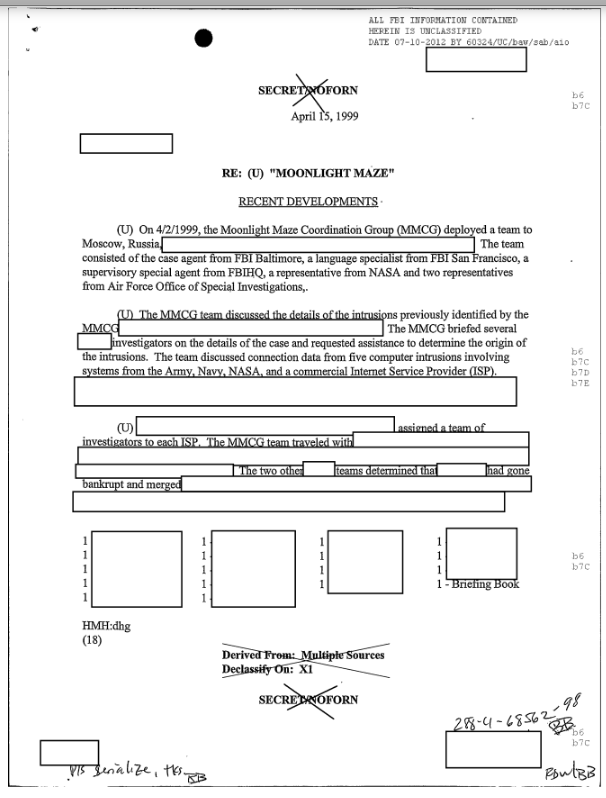 The document provides extensive background on the MOONLIGHT MAZE investigation of computer systems in the United States and at least four other nations (the United Kingdom, Canada, Brazil, and Germany), but, more than 15 years later, remains heavily redacted pursuant to the FOIA’s exemption 7. Steven Aftergood recently flagged an Army doctrinal publication on Secrecy News concerning the growing threat of enemy drone use. The paper notes that “Perhaps the most dangerous COA [course of action]… is the Swarm” in which drone clusters “are used by an adversary simultaneously for surveillance, indirect attack and direct attack;” it also cites the growing concerns of drones functioning as explosives. The paper, Aftergood notes, does not expressly state how to deal with both of these concerns, while citing a New York Times article from earlier this month on ISIS’s use of exploding drones. This week’s #tbt pick is chosen with Bulgarian NGO Access to Information Program’s (AIP) 20th anniversary in mind. AIP has produced valuable annual transparency audits since 2006 “to evaluate how the executive bodies fulfill their obligations for proactive publication of information online under the Access to Public Information Act and other legal regulations and to assess their readiness to respond to electronic requests.” This week’s pick is a 2010 blog post, using documents requested under the Bulgarian Access to Public Information Act by AIP and journalist Vesselka Venkova of the Bulgarian Duma daily, on whether Prime Minister of Bulgaria, Boyko Borisov, “pays his own way.” Borisov resigned in 2013 after national protests over – in part – corruption, but was reinstated in 2014.